Jumping over bombed roofs and bouncing through damaged window frames, a group of teenagers run and swing their way through buildings left broken-down by six years of war in the southern Syrian town of Inkhil. Parkour coach Ibrahim al-Kadiri and Muhannad al-Kadiri demonstrate their Parkour skills amid damaged buildings in Inkhil, west of Deraa, Syria. Ibrahim discovered Parkour in Jordan, where he had fled to escape the war. He now leads a group of 15 people, who make a virtue of necessity when using bombed buildings or tanks for their sport. Ibrahim Eid demonstrates his Parkour skills in front of a damaged building in the rebel-held city of Inkhil. Parkour, which was officially recognized as a sport in Britain, was developed in France in the 1980s and has gained popularity over the years. Inkhil is located near a front line between rebels and pro-government forces in an area that has been subjected to airstrikes and shelling during the conflict. Living in a crisis area, the young men say they find an escape in Parkour, which involves climbing and running over buildings and other objects. Parkour coach Ibrahim al-Kadiri drinks tea with his friends. The group has been practicing Parkour for around two years, often in school courtyards and on quiet days, when there is no fighting in the area. "Parkour gets us out of the atmosphere of war and makes us forget some of our pain and sorrow," Kadiri explains. 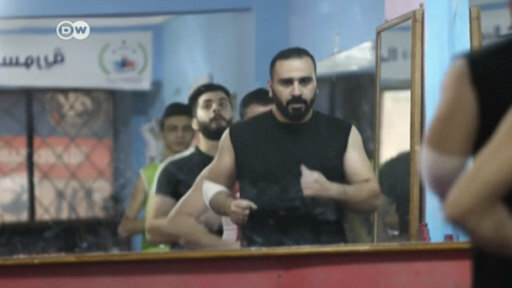 Parkour coach Ibrahim al-Kadiri works at his father's shop. At the beginning, the families of Inkhil opposed the sport which they saw as dangerous. When they realized their sons didn't listen and continued to train, eventually acquiring new skills, they changed their views of the sport and started encouraging them. The teenagers film and photograph each other and upload the footage on Facebook. They even have an audience. "Parkour is exciting and relies on physical fitness and skill," spectator Ayman says during one training session. "But it is dangerous, especially because they attempt it in damaged areas." Members of the group say Parkour takes them away from the atmosphere of war and helps them to take their sorrows away. It unloads their negative energy. But the Parkour leaps can take their toll and members of the group have suffered broken toes and bruises. One young man even twisted his neck once during training. 18-year-old Muhannad al-Kadiri describes his passion: "When I jump from a high place I feel free and I enjoy it. I love competing with my friends to see who can achieve the highest jump."